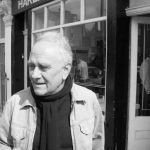 Gordon studied painting at Wimbledon School of Art in 1956, followed by a post-graduate year at the Institute of Education, London University in 1960, where, under the guidance of William Newland, ceramics soon took over his life. This was followed by three years part-time study at the Central School of Art, with Ruth Duckworth, Dan Arbeid and Bonnie Van Der Wettering. From 1961-1990, Gordon was Head of Art at Wimbledon College, although he continued to ‘pot’, exhibiting lat Heals (London), Primavera (Sloane Square), Crafts Centre (Hay Hill), Anschel (Kings Road), New Ashgate Gallery (Farnham), Candover Gallery (New Alresford) as well as undertaking numerous private commissions. He also has work in Denmark, Holland, Australia and America (Newark Museum). In the early 90s, Gordon rediscovered the American potter Peter Voulkos, who with Hamada had been one of his earliest influences, but whose work he had lost touch with since the late 70s. 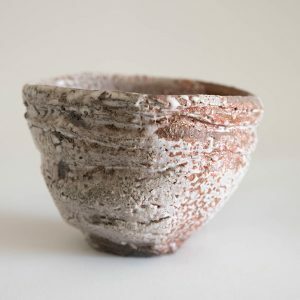 He remembered: “A small black and white catalogue of Voulkos’ recent Anagama work sent to me in 1993 by Braunstein-Quay Gallery, San Francisco, was in every sense a rebirth of my, up to that point, very sporadic and somewhat eclectic ceramic output”. Inspired by these early influences, Gordon’s output of thrown and altered large dishes and tea bowls started to take shape. 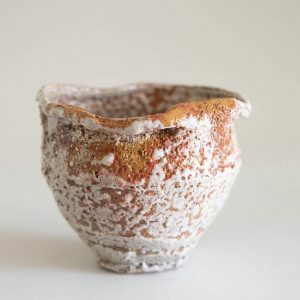 He experimented using additives, such as grog, wood ash and sawdust, wedged into earthenware clay to lighten and strengthen the mix, allowing him to produce much larger pieces that would otherwise crack or break during firing. 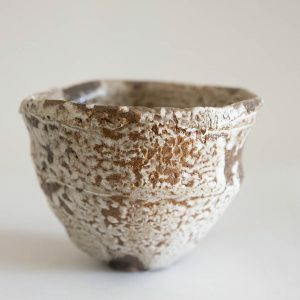 In the early 2000s, alongside his ceramic work, Gordon took to canvas again producing a series of abstract black and white paintings, expanding on the markings used to decorate some of his earlier tea bowls. In his latter days, Gordon started producing extra large thrown dishes utilising the maximum space his kiln would allow. These larger dishes meant he could use the surface as a canvas and started experimenting with markings inspired by Moroccan Beni Ourain rug designs.